Planning for UBC's newest residential neighbourhood is currently underway. Stadium Place Neighbourhood is being designed to fund UBC Athletics Gameplan stadium rebuild. Phase One of the Stadium Neighbourhood Planning Process is coming to a close. In this first phase of consultation, we will be seeking input from the entire campus community on living, working, studying and playing at UBC. Your experience can help us understand how this new neighbourhood can improve the campus experience of tomorrow. What we hear from you will guide our planning decisions. The planners have been roving around campus with pop up booths, hosting workshops, and holding meetings with groups of concerned community members. They've been doing a fairly intense outreach and publicity campaign seeking input. 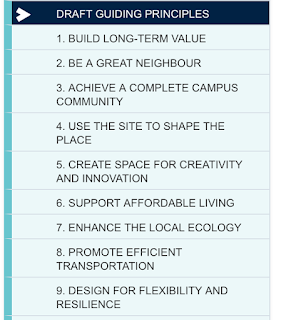 The draft guiding principles (see figure adjoining) are all quite nice. They convey very positive values. 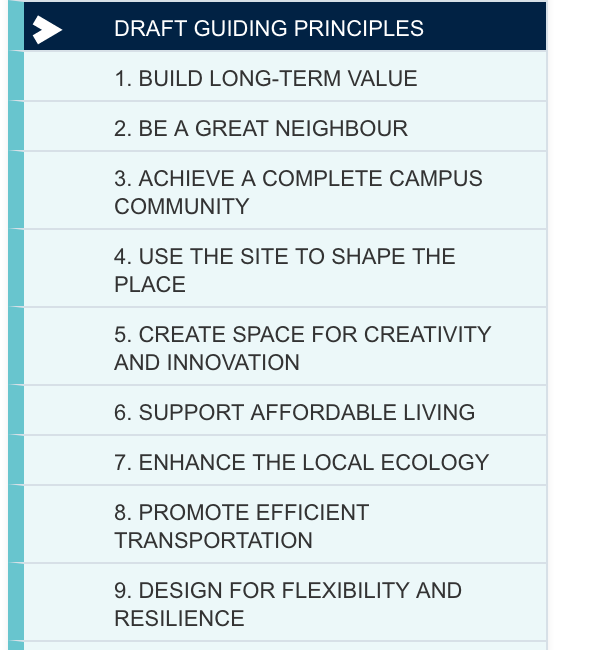 As of yet there are no clear explanations of how these principles will be operationalized - but to be fair, that is something that is hoped to emerge from the planning process as it itself develops. To a great extent these are admirable principles. Clearly most people want to encourage being "a great neighbour," support "creativity and innovation," or "support affordable housing." These are important, laudable principles. In the context of the university's stated desire to fully and unconditionally support reconciliation efforts with First Nations it seems that the Stadium Neighbourhood planning process brings us to a place where the university could do more than offer ceremonial invocations or erect monumental works of art. This is a chance for the university to put its money where it's heart and mouth is. How might this work? UBC has been using the revenue from land lease sales in the residential neighbourhoods to contribute to the university's endowment fund. UBC created a private development company, UBC Properties Trust, to manage residential development and major on campus builds. This has been a very successful venture, economically speaking, for UBC. In the Stadium Place Neighbourhood land lease revenues have been committed to the Gameplan and the renewal of the current Thunderbird Stadium. Maybe it's time to try something that might make a real difference. UBC could make a material commitment to back up its good rhetoric on First Nations reconciliation. UBC could dedicate a minimum of 25% of the revenue from the sale of land leases for something such as a First Nations youth education fund. As important as football and stadium sports are to UBC’s spirit building, making a material investment in First Nations education will have real, long term benefits for all British Columbians. Doing something like this builds upon UBC's work in support of reconciliation and meeting the call to action from the Truth and Reconciliation Commission. Imagine what a multi-million dollar endowment in support of First Nations' youth education could do for our city, our province, our country. UBC consistently ranks in the top 50 research universities globally. UBC champions global citizenship. UBC is a place of excellence. Think what UBC has to offer First Nations youth for our collective future wellbeing! Transforming the profits from Stadium Place into lasting legacy of educational opportunity is the perfect way for UBC to honour the reconciliation calls to action, to atone for the university's complicity in the residential school system, and to demonstrate in a concrete fashion UBC's words mean something serious. What's Up with #UBCBoG's Governance Committee?